Right now Van Halen are mad at Senator John McCain - for using their song Right Now during a campaign rally yesterday. Friday morning, minutes before the Republican US presidential candidate John McCain revealed Alaskan Governor Sarah Palin as his running mate, he strutted out onto a stage in Dayton, Ohio with Van Halen's 1991 track Right Now booming through the speakers. 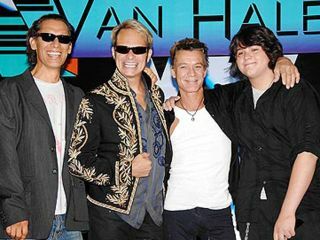 Make no mistake, the band is called Van Halen, not Van Palin. According to the band's publicist, Janie Lisweski, the members had no idea McCain was going to use their song as his entrance theme and were never approached by McCain's camp for permission to use the track. "Had they asked, permission would not have been granted," Liszweski said. Ouch! Perhaps next time McCain should consider using another Van Halen song: Loss Of Control.